Ok, so, despite owning a bajillion types of mascara and understanding the concept of a wardrobe of products for different occasions, I will never give up the search for The One. You know, that one perfect mascara that can do EVERYTHING, from length to curl and volume with no smudging, flakes or clumps. Ideally I also want to layer it, so I can ramp it up from day to night. 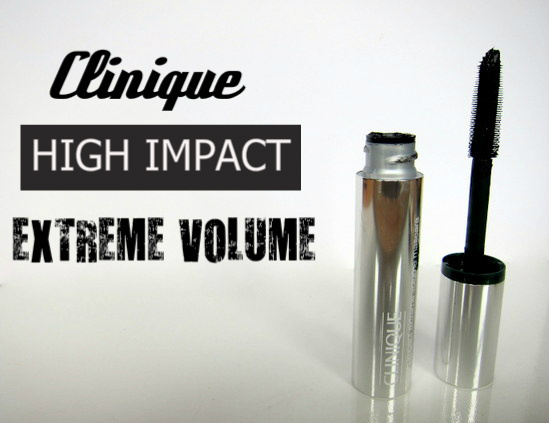 Lancome's mascaras have come the closest for me in the past, but Clinique are definitely giving them a run for the money with this latest release. High Impact Volume Extreme hit counters at the start of this month and oh boy is it a good 'un. Let's start with the price: it's €21 which is almost a fiver cheaper than a Lancome equivalent and about a tenner less than a Dior lash flatterer, so that's not to be sneezed at for a high end product. And you're getting a really great mascara for your money. 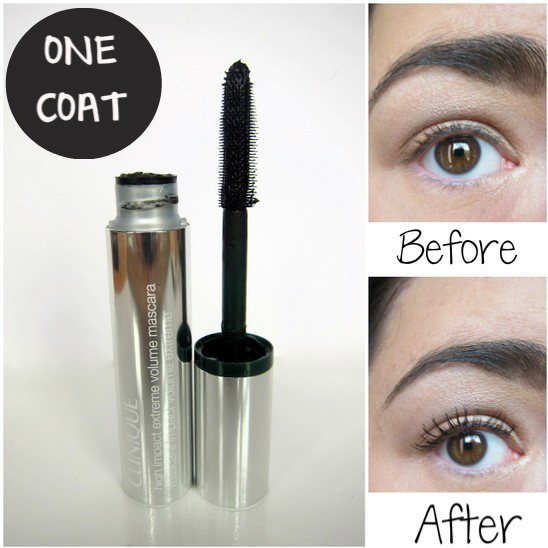 It does everything that I look for, creating a full on, fanned out lash look in just one coat. It has a ginormous moulded brush head, which picks up masses of product. Now, I'm not normally a fan of supersize brushes as I find them really messy, but happily, that's not the case here. The Clinique brush combs the product easily through my lashes for a clump and smudge free finish. It won't go crunchy on you so you can add another layer at any time during the day - and the domed tip takes care of those teeny little corner lashes, too. If you're in the market for a new mascara, this one should be close to top of your list. What are you currently using on your lashes? I'm also a fan of Lancome, the results of the Clinique look great in the photos you've posted. Armani's Eyes to Kill has blown They're Real out of the water for me but I'm alternating that with Max Factor's 2000 Calorie. Some days though, I forget the black altogether and rock a coloured offering. Wow, the difference is so striking! Love it! That's a nice everyday mascara but I'd need a couple of coats I think. I need big massive lashes! I do like the wand though, looks like it'd comb through the lashes nicely. Thanks for the review and recommendation! I'll definitely try this out! I love Chanel Inimitable Extreme, but it isn't cheap! Clinique mascaras just seem to have such a good reputation, I don't know how I haven't tried one yet! This really makes you r lashes look incredible, I agree with you about big brushes but I like that the bristles aren't too long on this one. I'm using Estee Lauder Sumptuous Extreme at the moment, it's only a sample and it's good, but not amazing. It looks really lovely and very black! Wow...noticeable difference. You have pretty eyes, girl! Oh WOW! Clinique has definitely stepped up their game. I can see the difference! Your eyes look great! LOVE this mascara! Its always lovely and works really well! Hey girl! Just came across this post. We seem to have a similar lash situation here :) I loved Chanel´s Inimitable but i switched to a much cheaper option latley - Lóreal´s Volume Million Lashes. I use the Mac Prep + Prime primer first as well as Shu Uemura´s lash curler and it works perfect for me - with just one coat.